by Chris Woodford. Last updated: September 23, 2018. Ladies and gentlemen, we are now cruising at 10,000 meters. Next time you hear your pilot say words like these, stop to ask yourself one question: how on Earth do they know? It's not as if a plane is like a car, easily able to keep track of how far its wheels have rolled along the ground. Indeed, there's no simple way to know how far you've flown at all (unless you know your equations of motion). 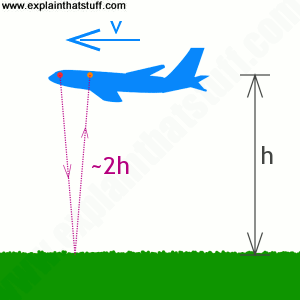 How, then, does a pilot measure a plane's height in the air? Simple! Using a handy gadget called an altimeter. Let's take a closer look at what these things are and how they work! Photo: The Alti-2 MA2-30 altimeter, popular with parachutists, used an analog (pointer and dial) display. This one is being worn by a marine about to make a parachute drop from 10,000 feet. Not everyone wants to wear an altimeter all the time, however, and altimeter watches with digital LCD displays, such as those made by Suunto, are more popular with hikers and mountain climbers. Some use built in barometers; others rely on GPS. Photo by Lance Cpl. Harley Robinson courtesy of US Marine Corps. Photo: Flying an airplane is a tricky operation. The altimeter, which measures your height above sea-level, is only one of dozens of instruments you have to keep an eye on, especially if you're flying low. But how low is too low? 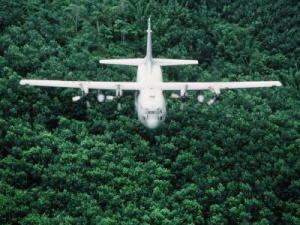 This plane is getting ready to drop supplies over a forest in Japan—and accurate altitude measurement is absolutely critical. Photo by MSGT Val Gimpis courtesy of US Air Force. You might not think it matters very much whether pilots know how high in the air they're flying; after all, they can always peer through the windows! But measuring altitude (your height above sea level) is much more important to a pilot than you might think. Some of Earth's mountain ranges are surprisingly high and harder to miss in bad weather than you might suppose. Mount Everest, for example, is an amazing 8.8 km (5.5 miles) above sea level, so flying at 10,000 meters (6.2 miles) doesn't give you that much room to maneuver. Then there are other planes to avoid. And it's actually more efficient to fly at higher altitudes where the air is thinner and overcoming air resistance uses less fuel. All told, there are plenty of good reasons for flying high. But how high, exactly? There are two main ways to measure altitude accurately. One is to measure the air pressure and figure altitude out from that. The other is to bounce a radio beam down from your plane and time how long it takes to reflect back up again. How does a pressure altimeter work? 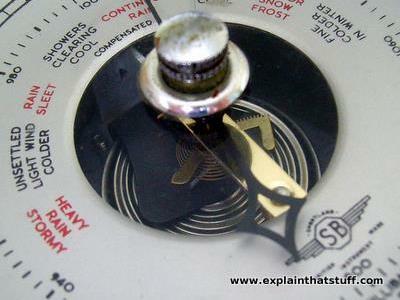 Photo: A pressure altimeter is a more sophisticated version of an aneroid barometer, like this. Instead of showing the pressure on the dial, it shows height—but that's okay because there is an exact correlation between the two. Why do we have air pressure? Earth's gravity pulls everything toward it—and everything includes even the smallest things you can imagine, like molecules of air. If you're an air molecule near the ground, you've got lots of other air molecules above you pushing and squashing you down; higher up, there are fewer molecules and there's less pushing. That's why air pressure is highest at Earth's surface and gradually falls, in a systematic way, the higher up you go. Measuring the air pressure is therefore (in theory, at least) a simple and effective way of measuring altitude. The altimeters onboard most planes are actually aneroid barometers (pressure-measuring instruments) that have been calibrated (marked with a scale) so they show height instead of pressure. Like normal aneroid barometers, they consist of a hollow, sealed box that expands (as the pressure falls) or contracts (as the pressure rises). As the box changes size, by very tiny amounts, an intricate system of levers and gears magnifies its movements and makes a pointer rotate on a dial marked with height measurements. Hey presto, tiny changes in air pressure become accurate measurements of altitude. Photo: How a pressure altimeter works: This is a typical pressure altimeter from the 1930s by Victor Carbonara of the Bendix Aviation Corporation. Looking from the side, you can see a sealed, air-filled box (red) that expands or contracts according to changes in pressure. Its movements are amplified by a system of linkages and levers (blue) and a gear mechanism (green), which operates the altimeter pointers. Now looking at the diagram on the right, we can see how the altitude is displayed by moving pointers on a dial (brown), calibrated in hundreds and thousands of feet. This diagram is from US Patent #2,099,466: Altimeter, courtesy of US Patent and Trademark Office. Pressure altimeters were invented in the 1920s by German-born engineer Paul Kollsman, who was granted US Patent #2,036,581: Level flight indicator in April 1936. The very first one made its debut on September 24, 1929 in a pioneering "instrument flight" by Lieutenant General James H. "Jimmy" Doolittle. Radio altimeters don't suffer from these problems. They're simpler and work in a similar way to radar (the system planes, ships, and other vehicles use to navigate): they just fire a beam of radio waves down from the plane and wait for the reflections to return. Since radio waves travel at the speed of light (300,000 km or 186,000 miles each second), it takes only a few hundredths of a second for a radio beam to make the 20,000-meter or so round trip to Earth's surface and back. The plane times the beam and calculates its altitude in kilometers by multiplying the time in seconds by 150,000 (that's 300,000 divided by two: don't forget the beam has traveled twice as far as its own altitude going to the ground and back again). Radio altimeters are much quicker and more precise than pressure instruments and are widely used in high-speed airplanes or ones that need to fly at particularly low altitudes, such as jet fighters. 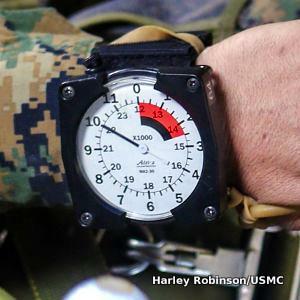 Photo: How a radio altimeter works. The speed of light is about a million times faster than the cruising speed of a typical plane (v), so a radio signal bounced to the ground and back travels a distance of about twice the plane's altitude (2h). That means you can find the altitude by multiplying the time the signal takes to go from the transmitter (red circle) to the receiver (orange circle) by half the speed of light. In theory, the faster the plane travels, the less accurate the measurement, because the radio beam has further to travel; in practice, the speed of light is so much faster than the speed of the plane that any error is minimal. There are at least two more ways of measuring altitude, but they're not widely used on airplanes. One method is to use GPS (global positioning system) signals from navigation satellites in space. In much the same way that GPS signals from three satellites can be used to pinpoint your position on Earth's surface (as explained in our main article on how GPS works), using signals from four or more satellites lets you calculate your height above Earth as well. Unfortunately, GPS altitude measurements are not as accurate as those made with conventional altimeters, so they're not likely to replace existing technologies on airplanes anytime soon. Photo: These topographical maps of the surface of Mars were made in 2001 by NASA's MOLA space probe, using laser altimetry. 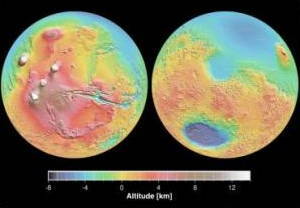 Red, orange, and yellow areas are mountains; green, blue, and violet areas are craters. Photo by courtesy of NASA Jet Propulsion Laboratory (NASA-JPL). Another way of measuring altitude involves shining laser beams of infrared light down from a plane, helicopter, or satellite and calculating the time to return, much like using radio and radar. The reflected beam is collected by mirrors and lenses and focused on a photocell detector sensitive to infrared light. As the aircraft flies along, it systematically measures its altitude and plots what's called a topographical map of the surface contours beneath it. This technique is called laser altimetry and it has been widely used by space probes to map surface features on other planets. NASA's Mars Orbiter Laser Altimeter (MOLA) works this way. Pilot's Handbook of Aeronautical Knowledge by Federal Aviation Administration. Available online and also published in book format by Skyhorse Publishing, 2007. The official handbook of flying a plane, explaining the theory and practice of flight and all you need to know about your cockpit instruments. Satellite Altimetry and Earth Sciences by Lee-Leung Fu, Anny Cazenave. Academic Press, 2001. All about measuring altitude from space. Finding Mercury's Water with Infrared Lasers and Neutron Counters by Douglas McCormick. IEEE Spectrum, December 4, 2012. How laser altimeters and spectrometers helped NASA make maps of Mercury's surface. US Patent 2004/0141170 A1: System for profiling objects on terrain forward and below an aircraft utilizing a cross-track laser altimeter by James R. Jamieson et al. Granted August 22, 2006. A recent patent describing a laser-based system for mapping the ground profile beneath an airplane. US Patent #4,373,805: Laser altimeter and probe height sensor by Richard Mallinson, The Singer Company. Granted February 15, 1983. A highly accurate laser altitude probe for use in flight simulators. 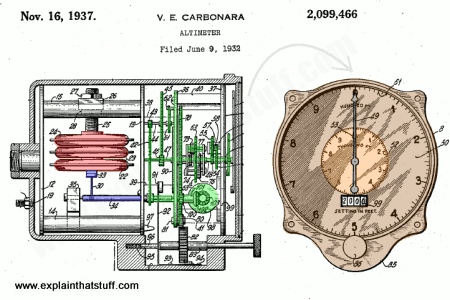 US Patent #2,099,466: Altimeter by Victor Carbonara. Granted November 16, 1937. This is the simple aneroid barometer, pressure altimeter described above. US Patent #2,022,517: Radio echo altimeter by Franklin G. Patterson. Granted November 26, 1935. Describes a simple radio altimeter using a radio transmitter and receiver. US Patent #2,036,581: Level flight indicator and US Patent #1,930,899: Aneroid and operating means therefor by Paul Kollsman. Granted October 17, 1933. The original pressure altimeter and the aneroid barometer it was based on.